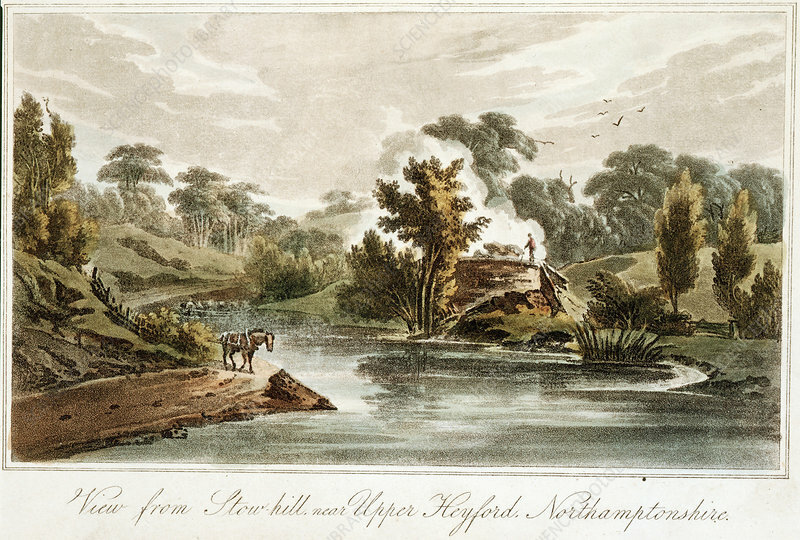 Grand Junction Canal from Stow Hill near Upper Heyford, Northamptonshire, 1819. A lime kiln can be seen in the centre of the picture. Lime became important to agriculture, building (urban expansion at this time) and the growing chemical industry. The Grand Junction Canal was part of the network linking London with the Midlands manufacturing towns, and with Liverpool. The canal was built between 1793 and 1805, with William Jessop as its chief engineer, and James Barnes as resident engineer responsible for most of the day to day construction. It was originally planned to build the canal from Braunston to the Thames at Brentford, but in 1794 it was decided to build a branch to Paddington, which was much closer to central London. From Tour of the Grand Junction by J Hassell, 1819. Artist: John Hassell.